Marketing Administrator involves actively in promoting the company’s product and services and ensures that there is always an enhanced flow of customers to the company; they actively work on building brand presence, creating slogans, advertisement campaigns and so on. 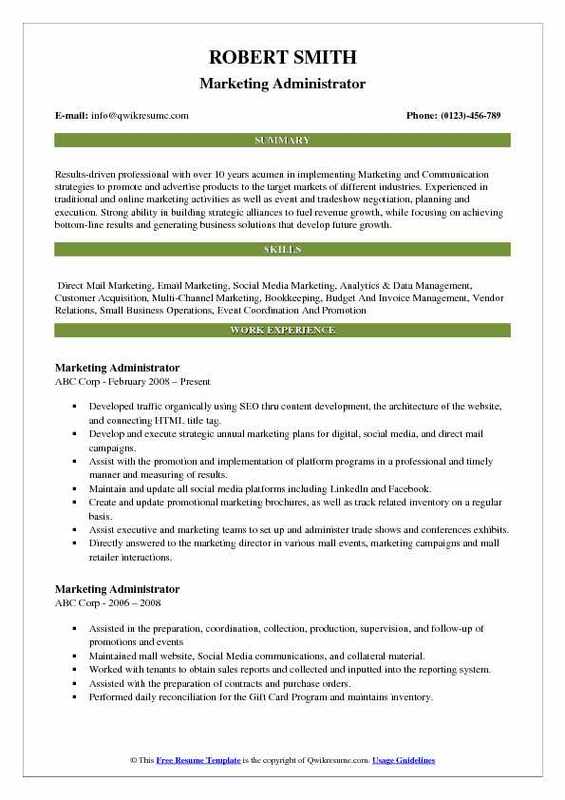 The other common job responsibilities of a marketing administrator include conducting marketing research, implementing marketing strategies, communicating with staff, management, media, customers and vendors to supply information and promotes a positive image of the company. 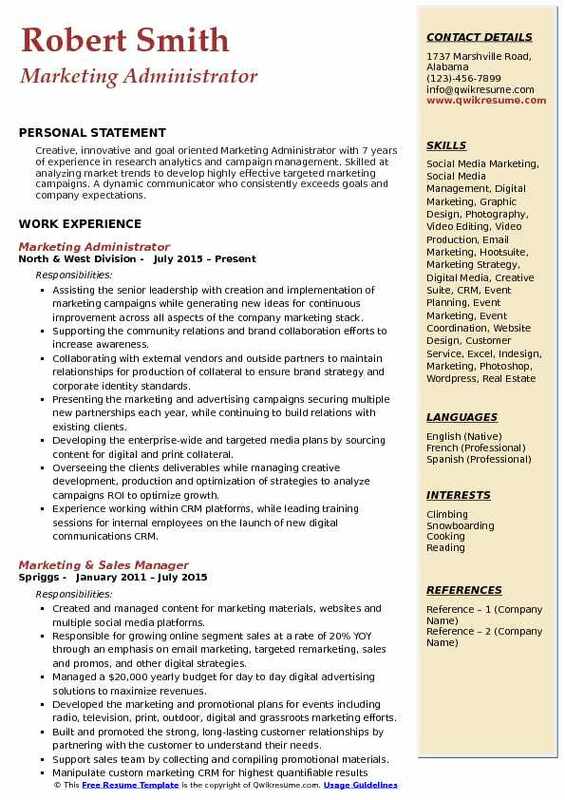 Employers expect certain skill sets from a marketing administrator, some of the best skills that will enhance the Marketing Administrator Resume sample are social media awareness, creativity, budget-conscious approach, investigation skills, negotiation tactics, and good communicative skills. A bachelor’s degree in marketing, communications, public relations, advertising or its related field can gain a marketing administrator job; however, a Master’s degree in Administration or marketing would enhance further the marketing administrator’s career prospects. 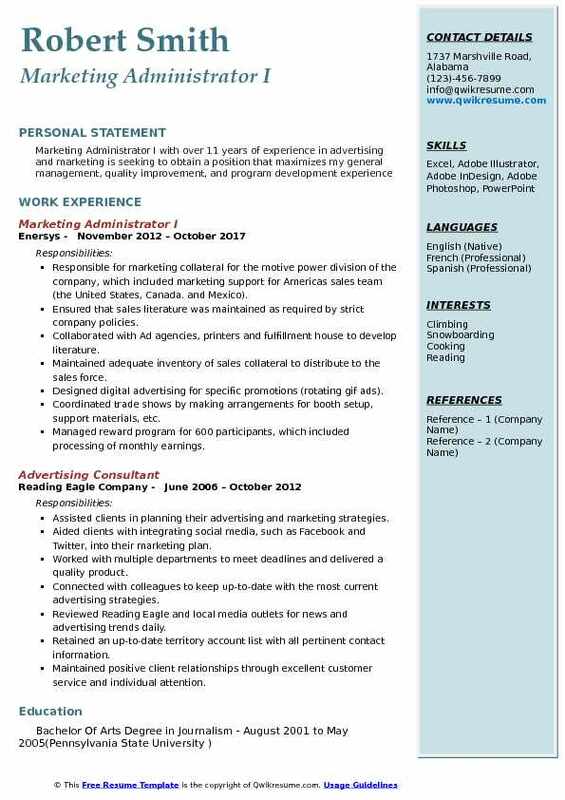 Summary : Marketing Administrator with 15+ years of years of experience in the Advertising and Social service domains. Recognized for consistent success in developing systems, processes, and methodologies to upgrade practice operations, increase revenues and enhance profit performance. 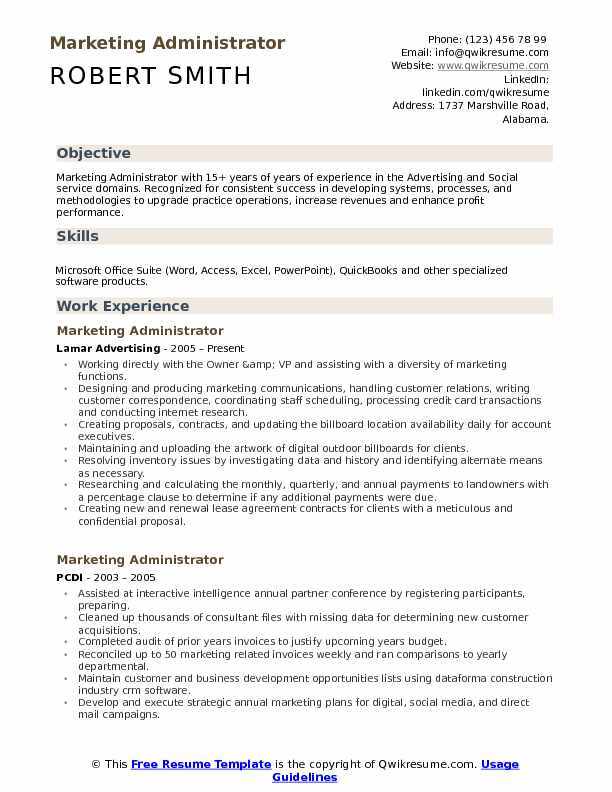 Skills : Microsoft Office Suite (Word, Access, Excel, PowerPoint), QuickBooks and other specialized software products. Working directly with the Owner & VP and assisting with a diversity of marketing functions. Designing and producing marketing communications, handling customer relations, writing customer correspondence, coordinating staff scheduling, processing credit card transactions and conducting internet research. Creating proposals, contracts, and updating the billboard location availability daily for account executives. Maintaining and uploading the artwork of digital outdoor billboards for clients. Resolving inventory issues by investigating data and history and identifying alternate means as necessary. Researching and calculating the monthly, quarterly, and annual payments to landowners with a percentage clause to determine if any additional payments were due. Creating new and renewal lease agreement contracts for clients with a meticulous and confidential proposal. Liaison to the Office Manager, inputting expense reports and submitting the weekly timesheets. Creating completion reports as proof of performance for agencies approval. Administering advertising, accounts, inventory / purchasing requirements. Providing administrative duties including correspondence reports, memorandums, charts, and calendars. Managing a variety of administrative and clerical functions in a high-volume office. Headline : A deadline-orientated, self-managed Senior Marketing Administrator with six years of experience in mentoring and project management. Forged organization-wide adherence to brand identity and environmental signage standards. Created and launched the airports current advertising campaign that was picked up both nationally and internationally by key clients. Negotiated vendor contracts that reduced costs by 15 to 35%. Developed, designed and deployed the "A Brighter TUS" airport construction awareness campaign and the "Travel Smart with TUS" advertising campaign. Expanded the breadth and reach of the departments marketing budget of $370,000 by negotiating cost-advantaged vendor contracts and bringing many outsourced projects in-house. Return on investment measurements for marketing campaigns and various projects via preparing, monitoring, and analyzing reports. Planning and tracking the department-wide budget using host analytics for financial planning, and Oracle for purchasing products and services. Achieved consistent on-budget results for 3 consecutive years and developed spending plans consistent with the department's purpose. Increased the community engagement and visibility through in-game promotional event development and coordination with the University of Arizona football team and Tucson Roadrunners Hockey League. Significantly expanded the marketing contact list by over 600% with one viral social media contest. Acquired oversight responsibility of the project team for the airports' first employee intranet including design, development, launch, and management of the site. Managed the flytucson.com mobile responsive website redesign (launched December 2016). Awarded the 2016 Cigna well-being award for the development and coordination of the airport's wellness program consisting of monthly health coaching, employee assistance outreach, lunch and learn presentations, corporate fitness challenges, annual health and safety fairs, biometric screenings and health risk assessment events. , which also resulted in company-wide premium reductions. Summary : Results-driven professional with over 10 years acumen in implementing Marketing and Communication strategies to promote and advertise products to the target markets of different industries. 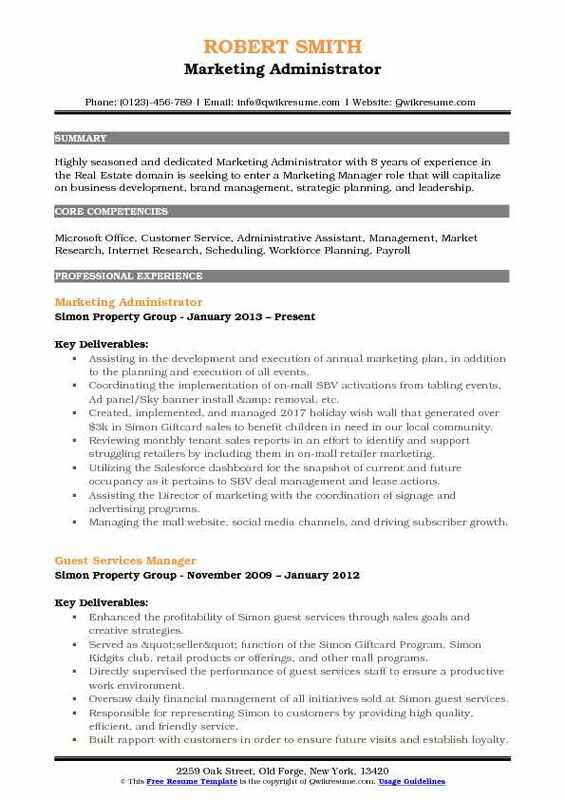 Experienced in traditional and online marketing activities as well as event and tradeshow negotiation, planning and execution. Strong ability in building strategic alliances to fuel revenue growth, while focusing on achieving bottom-line results and generating business solutions that develop future growth. Developed traffic organically using SEO thru content development, the architecture of the website, and connecting HTML title tag. Develop and execute strategic annual marketing plans for digital, social media, and direct mail campaigns. Assist with the promotion and implementation of platform programs in a professional and timely manner and measuring of results. Maintain and update all social media platforms including LinkedIn and Facebook. Create and update promotional marketing brochures, as well as track related inventory on a regular basis. Assist executive and marketing teams to set up and administer trade shows and conferences exhibits. Directly answered to the marketing director in various mall events, marketing campaigns and mall retailer interactions. Act as liaison between the marketing team and other company divisions for all aspects of companywide outbound marketing. 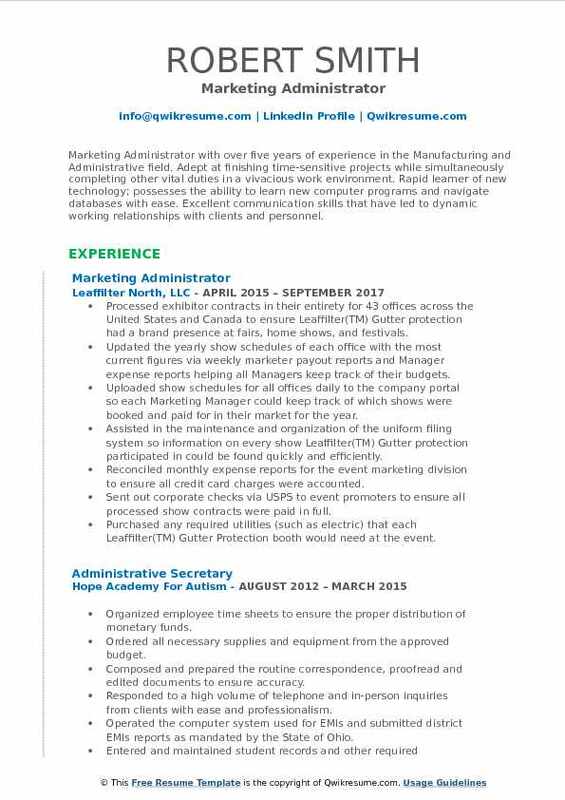 Objective : Marketing Administrator with over five years of experience in the Manufacturing and Administrative field. Adept at finishing time-sensitive projects while simultaneously completing other vital duties in a vivacious work environment. Rapid learner of new technology; possesses the ability to learn new computer programs and navigate databases with ease. Excellent communication skills that have led to dynamic working relationships with clients and personnel. Processed exhibitor contracts in their entirety for 43 offices across the United States and Canada to ensure Leaffilter(TM) Gutter protection had a brand presence at fairs, home shows, and festivals. Updated the yearly show schedules of each office with the most current figures via weekly marketer payout reports and Manager expense reports helping all Managers keep track of their budgets. Uploaded show schedules for all offices daily to the company portal so each Marketing Manager could keep track of which shows were booked and paid for in their market for the year. Assisted in the maintenance and organization of the uniform filing system so information on every show Leaffilter(TM) Gutter protection participated in could be found quickly and efficiently. Reconciled monthly expense reports for the event marketing division to ensure all credit card charges were accounted. Sent out corporate checks via USPS to event promoters to ensure all processed show contracts were paid in full. Purchased any required utilities (such as electric) that each Leaffilter(TM) Gutter Protection booth would need at the event. Contacted show promoters via email and telephone with any questions we had to assure each event ran smoothly. Assisted with projects in the digital and print marketing departments when needed. Responsible for marketing collateral for the motive power division of the company, which included marketing support for America's sales team (the United States, Canada. and Mexico). Ensured that sales literature was maintained as required by strict company policies. Collaborated with Ad agencies, printers and fulfillment house to develop literature. Maintained adequate inventory of sales collateral to distribute to the sales force. Designed digital advertising for specific promotions (rotating gif ads). Coordinated trade shows by making arrangements for booth setup, support materials, etc. Managed reward program for 600 participants, which included processing of monthly earnings. Provided general support to the sales field to create powerpoint presentations and other materials. Facilitated the communication of product changes and distributing announcements to the field representatives. Objective : Energetic, tactical, Marketing Administrator with over three years of experience as a Marketing Coordinator. Exhibits demonstrated strengths in assessing organizational needs, implementing project plans and establishing initiatives to ensure the quality promotion and improved service while preserving client relations. Managing the marketing department’s accounting and billing functions, including weekly invoice and expense report processing and monthly billing. Account coordination for the client, Castle Hills including collateral delivery and updates, weekly and monthly sales reporting and producing materials for new model homes. Maintaining and updating realtor emails and eblast contacts through vertical response. Researching, writing and editing copy for brightcomarketing.com newsroom and event PR releases. Producing floorplans, digital media, and photography for the client (Bright Realty) social media pages. Arranging prize pick-ups and monitoring advertising responses and surveys for events. Providing monthly google analytics reports for American Legend Homes, Castle Hills, Belclaire homes and discovery at the realm websites. Conducting orientation, advantage software setup and training for new employees. Castle hills spring concert series 2016: organized and oversaw costume contest for two event dates. Hot on homes realtor event: conducted setup, drawings, catering and breakdown for the castle hills new model home opening for Saxony by Shaddock homes, hosted by Hot on Homes. Headline : A marketing professional with 10+ years of experience who embraces new technologies to help strengthen an organization through strategic marketing and communications efforts. Managed the Co-Op Programs including enforcement of set policy and independent decision making to determine the proper course of action regarding claim submissions and dispute resolution. Coordinated the event, logistics and trade show arrangements. Managed vendor relationships and contract renewal negotiations for third party services related to sales programs. Responsible for policy comprehension/enforcement, establishing claims processing work flow, invoicing payment substantiation and exercise of proper judgment and decision making. 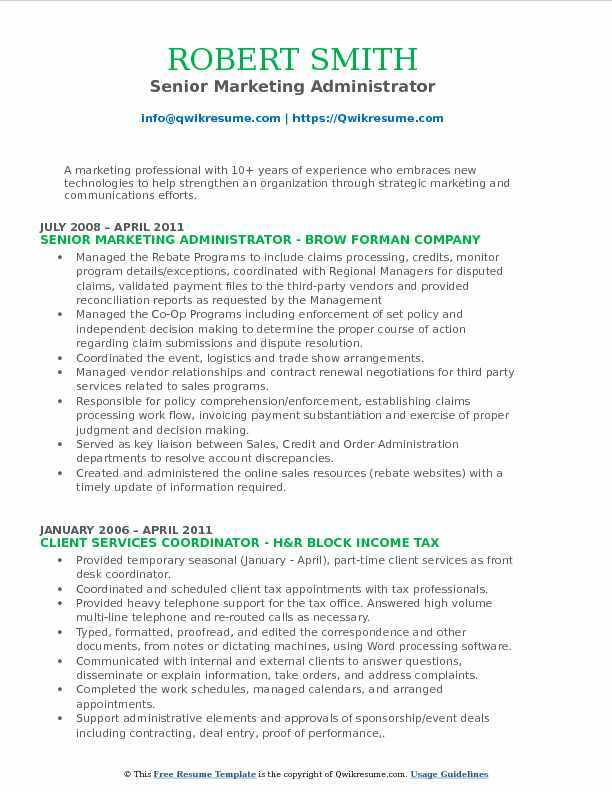 Served as key liaison between Sales, Credit and Order Administration departments to resolve account discrepancies. Created and administered the online sales resources (rebate websites) with a timely update of information required. Worked with web developers regarding development and support of said resources. Summary : Highly seasoned and dedicated Marketing Administrator with 8 years of experience in the Real Estate domain is seeking to enter a Marketing Manager role that will capitalize on business development, brand management, strategic planning, and leadership. Assisting in the development and execution of annual marketing plan, in addition to the planning and execution of all events. Coordinating the implementation of on-mall SBV activations from tabling events, Ad panel/Sky banner install & removal, etc. Created, implemented, and managed 2017 holiday wish wall that generated over $3k in Simon Giftcard sales to benefit children in need in our local community. Reviewing monthly tenant sales reports in an effort to identify and support struggling retailers by including them in on-mall retailer marketing. Utilizing the Salesforce dashboard for the snapshot of current and future occupancy as it pertains to SBV deal management and lease actions. Assisting the Director of marketing with the coordination of signage and advertising programs. Managing the mall website, social media channels, and driving subscriber growth. Successfully cultivating the relationships with retailers to communicate SBV initiatives including the gift card, family programming, and special promotions (SGK partnership). Played a pivotal role in achieving 2017 gift card stretch goal in October, ending the year 192% above stretch. Supporting the administrative elements of SBV deals including clicking off on assigned milestones, preparing and sending invoices, payment collection, and proof of performance. 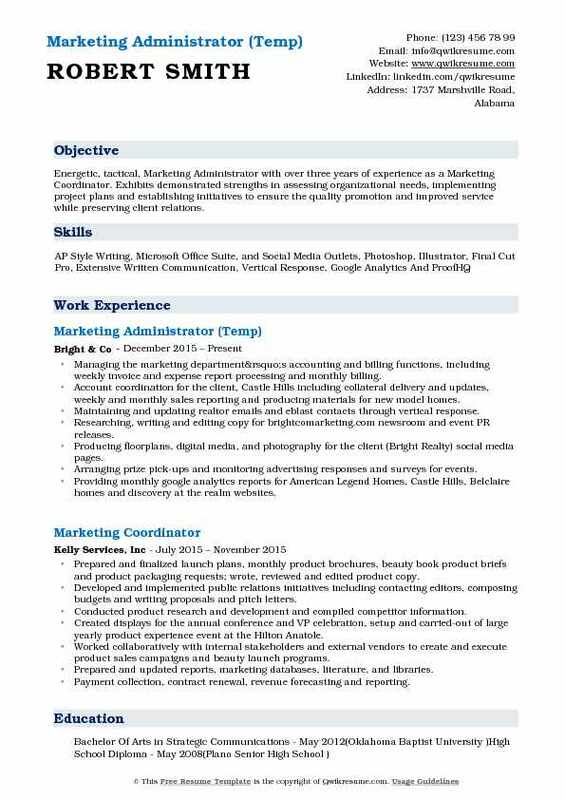 Headline : Creative, innovative and goal oriented Marketing Administrator with 7 years of experience in research analytics and campaign management. Skilled at analyzing market trends to develop highly effective targeted marketing campaigns. A dynamic communicator who consistently exceeds goals and company expectations. Assisting the senior leadership with creation and implementation of marketing campaigns while generating new ideas for continuous improvement across all aspects of the company marketing stack. Supporting the community relations and brand collaboration efforts to increase awareness. Collaborating with external vendors and outside partners to maintain relationships for production of collateral to ensure brand strategy and corporate identity standards. Presenting the marketing and advertising campaigns securing multiple new partnerships each year, while continuing to build relations with existing clients. Developing the enterprise-wide and targeted media plans by sourcing content for digital and print collateral. Overseeing the clients deliverables while managing creative development, production and optimization of strategies to analyze campaigns ROI to optimize growth. Experience working within CRM platforms, while leading training sessions for internal employees on the launch of new digital communications CRM. Responsible for identifying emerging trends and system-wide initiatives to penetrate the new market. Generating ideas for multi-departmental internal program launches, while overseeing scope and progress of projects. 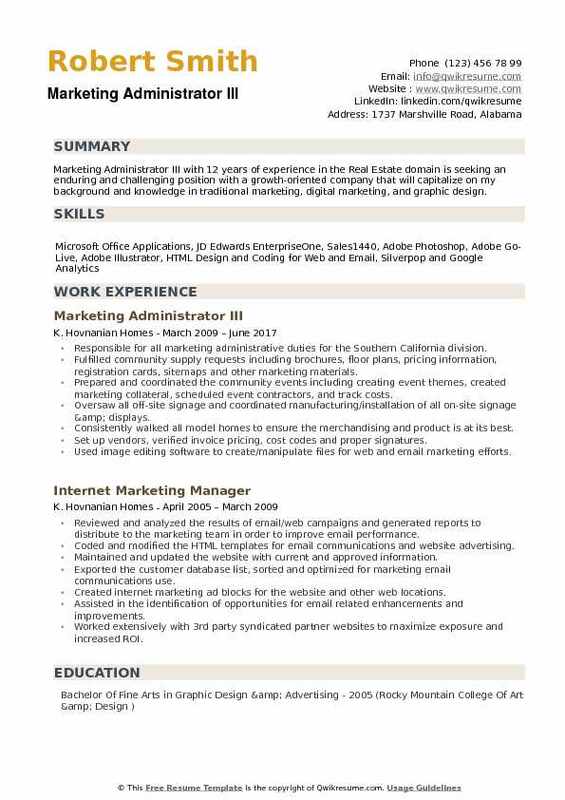 Summary : Marketing Administrator III with 12 years of experience in the Real Estate domain is seeking an enduring and challenging position with a growth-oriented company that will capitalize on my background and knowledge in traditional marketing, digital marketing, and graphic design. 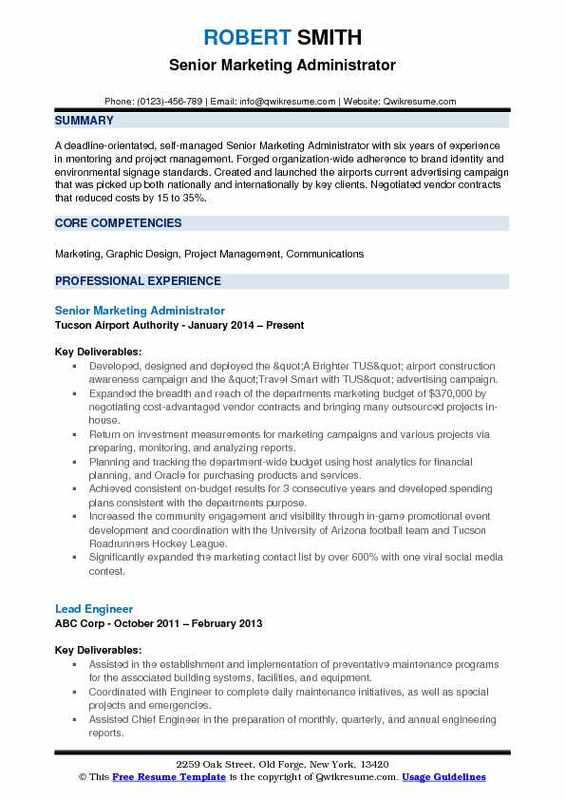 Responsible for all marketing administrative duties for the Southern California division. Fulfilled community supply requests including brochures, floor plans, pricing information, registration cards, sitemaps and other marketing materials. Prepared and coordinated the community events including creating event themes, created marketing collateral, scheduled event contractors, and track costs. Oversaw all off-site signage and coordinated manufacturing/installation of all on-site signage & displays. Consistently walked all model homes to ensure the merchandising and product is at its best. Set up vendors, verified invoice pricing, cost codes and proper signatures. Used image editing software to create/manipulate files for web and email marketing efforts. Designed and created the promotional flyers to distribute to prospects and brokers. Obtained performance results for all media outlets in order to increase qualified traffic.